SOULspace: "Hanuman's Ramayan", reviewed by my resident Storyteller! 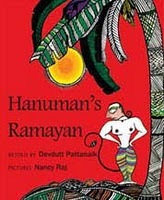 "Hanuman's Ramayan", reviewed by my resident Storyteller! 'Finally, what matters is the story, not the teller." A storyteller feels the pang!! How can Devdutt Pattanaik finish the story with such a disputable statement is what I thought? Is he justified in saying this? I am biased when I say this, but every story is in the tellers skill as he weaves his magic around the warp and the weft of his story. Truly magic has been created in this book by Devadutt Pattanaik which has been illustrated by Nancy Raj. Tulika Books happily sent free books to all those who had participated in their very first blogathon. It arrived when we were just leaving Kanpur for our annual vacation to Chennai. So it got packed in. But somehow in between the packing and the leaving, it got unpacked, and I found my daughter reading it! "Amma I will read the book and tell you the story first." And she promptly read the book. I was fascinated both by the story and the tellers grasp of its content. With ease she told me the details, and the story flowed as beautifully as it had been illustrated. She told me how Valmiki searched for the Monkey, and his query and finally how Hanuman was happy to eat up his story(! ), as he believed he had written the story for Ram...and not for the name (glory) of writing the story. She got it all...and she told it to me so well...not once even looking at the script..though she did go back and forth as she looked and shared the illustrations with me. So much for the story and for my resident teller...let me share more about the actual story teller. This story is retold by Devadutt...who is a self taught mythologist, ethnologist and storyteller. For the past 12 years he has unearthed and analysed uncommon Hindu mythological stories for all and applied it to corporate scenario. I have been following his blog for some time now, so I was pleasantly surprised to see that this beautiful Red book is from his collection. Again a story I have not come across...and so simple in its content, yet powerful in its message. I can only say thanks Tulika!! Nancy Raj has brought out the story using the Mithila Art form, or Madhubani as it is also known. Truly the book is a visual treat. What the book does is to make us aware of a multitude of details...a story, a writer, an illustrator, an art form...what more does one want!! Add it to your collection...its absolutely worth it!! Loved the review ! Will surely get this book for my daughter. Lovely review. It sounds even better to hear it from a child. Can you share the detail where I can get this book in chennai. Sowmsya's review is tempting me very badly to read and feel Ramayana through Hunuman's view. Thank you sowmya :) thats a wonderful review.. the nail marks on the banana leaves is my fav painting too.